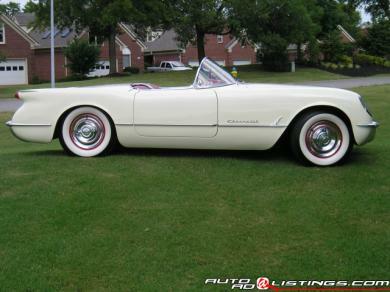 Extremely rare 1953 Corvette Roadster, Serial # E53F001254 (254th Corvette ever produced). 300 were hand built in Flint, Michigan. These cars were hand made. Slightly over 100 53's are known to have survived in any condition. Car was on loan to the National Corvette Museum in 2008. Car received Bloomington Silver with a score of 94% as well as the Sapphire Award at the 2007 National Corvette homecoming. Numbers matching with the exception of a 54 block. A 53 block and a after market hardtop goes with car. Car has been featured in numerous national publications since the 1970's & as recently as included in the General Motors/CMA official 2007 calendar,Spring 2007 Corvette Quarterly, the Nov./Dec. 2008 edition of the American Sports Car. Car is to be featured in the Jan./Feb. 2009 edition of the American Sports Car. 100% operational & 100% as described.